“I’m so scared I’m having difficulties sleeping,” said André Karipuna, a young indigenous community leader of a protected area in the Brazilian Amazon. According to satellite data from fly-overs commissioned by All Eyes on the Amazon in June and October 2018, his fears are very real. And now after the election of Brazil’s new president, Jair Bolsonaro, even more so. They show that forest destruction is four times greater than official data suggests. Over 10.000 hectares of the Karipuna territory have already been destroyed – 80 percent in the last three years alone. This deforestation is not only devastating to the Karipuna community. It also forms a major threat to our climate. 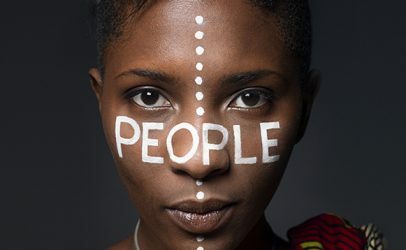 André presented the new data last week at a UN meeting on business and human rights in Geneva and during a press conference at the Greenpeace office in Amsterdam. His community is one of the indigenous populations supported by the All Eyes on the Amazon program, a joint initiative of Hivos and Greenpeace with nine other coalition partners. “The data is hard evidence that the situation in the Amazon is even worse than we thought,” said Tanja Brok, communication officer for All Eyes on the Amazon at Hivos. “But even with this amount of evidence, it’s still uncertain whether the government or courts will take action to protect the area and its inhabitants,” she added. The Karipuna community is under constant threat from illegal loggers and land grabbers. Brazilian law stipulates that their land is protected as official indigenous territory, but this has little effect on reality. The law is not only broken at will, but suffers constant attack by government officials and corporations who want to use the Karipuna’s land for agriculture, mining and oil drilling. As a result, the Karipuna’s resources are violently exploited on a daily basis, and even attacked. Earlier this year, a building belonging to the government agency responsible for protecting the area near André’s village was burned down. After that, illegal loggers threatened the village would be next. 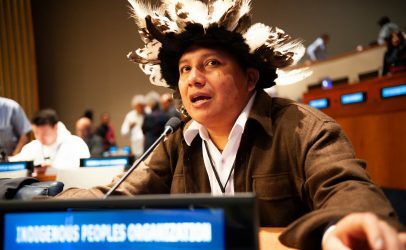 In a moving speech in Geneva, André called for help from the international community to protect his people and stop companies from taking over their land and destroying the forest. André’s call echoes that of his brother Adriano Karipuna, who addressed the UN Permanent Forum on Indigenous People earlier this year. (Updated on October 29.) Their calls to action come at a delicate time for Brazil. Intensified mobilization by indigenous groups has fended off changes to the indigenous territory law and won them the support of the General Prosecutor, who is starting to prosecute violators. On the other hand, Brazil is now facing the presidency of one of the most conservative, right-wing politicians the country has known so far, Jair Bolsonaro. Bolsonaro has vowed that no more indigenous reserves will be demarcated and existing reserves will be opened up to mining. “Bolsonaro already announced he is going to take away our rights. We are scared and very worried that we are going to lose our land and that it is going to be sold,” said André. 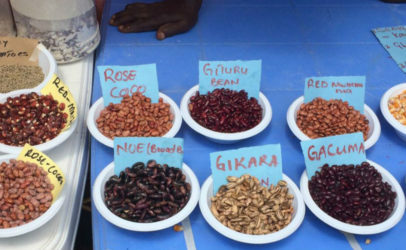 While this is very worrisome, Hivos, Greenpeace and our other coalition partners remain hopeful. “Doing nothing is not an option. We have to act now to stop this serious threat. This could be the Karipuna’s last chance to protect their culture, language, community and land. We must make sure the world hears their story,” said Tanja. The Karipuna fully intend to use the new satellite evidence to fight for their cause. 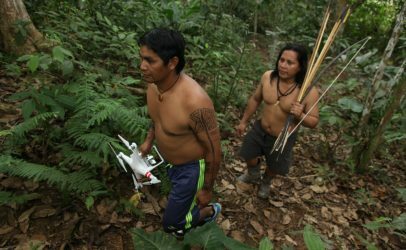 This is why indigenous monitoring teams in Brazil, Ecuador and Peru are being trained by All Eyes on the Amazon to use smartphones, drones and radar satellite technologies to gather evidence. With this data, they can pinpoint when and where deforestation takes place and help prosecute those responsible. All Eyes on the Amazon is also training partners and indigenous communities to file (international) lawsuits and mobilize the public through campaigns. Fortunately, there are signs that the tide is turning in favor of indigenous resistance. On October 23, the Kofan people of Sinangoe in the Ecuadorian Amazon won a landmark legal battle. With support from Amazon Frontlines, the Ceibo Alliance and more than 60 national and international organizations, this indigenous community succeeded in protecting the headwaters of the Aguarico River from gold mining. A decision that should inspire and galvanize many other indigenous communities across the Amazon to do the same.